Carma Poodale : Why The Uproar Over a Single Lion But Not For Shelter Pets? 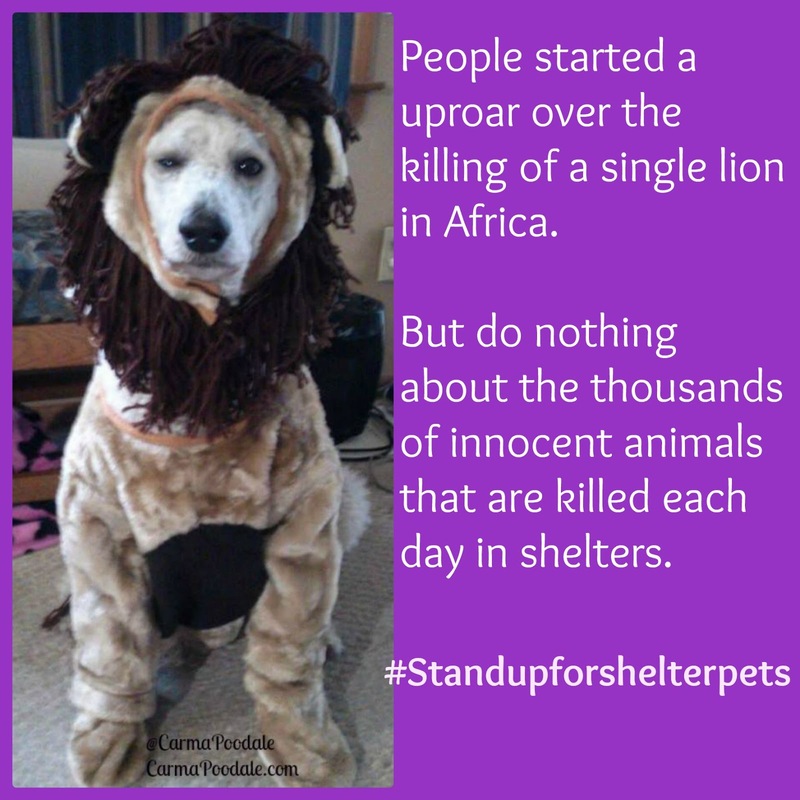 Why The Uproar Over a Single Lion But Not For Shelter Pets? Everyday social media is full of people who are outraged over an African lion named #Cecil the lion being lured out of his home and killed. I can't scroll down my Twitter or Facebook feed without seeing someone talking about it. Seems everyone is outraged over the fact this lion was killed. Honestly, I didn't know this lion Cecil even existed and I imagine many people are like me and never heard of him either. Why is everyone upset about a lion being killed when other lions have been hunted for years? Trophy hunting has been happening for years and years. Some of the sites I have found in internet searches have been in business since the 70's. What is the difference in a lion being killed vs a dog or cat in a shelter being killed for space? Yes, I said for space. Everyday across america, shelter pets are being euthanized due to bad temperament, their required time is up or the shelter ran out of room. Shelters kill healthy pets to make room for the incoming. A couple of years ago ma went to a county kill shelter and rescued 12 pets. She was taking those 12 pets to a no kill shelter. The shelter was so happy that 12 pets would get a new lease on life and they would not have to euthanize due to no space available. The problem was , while the paperwork was being done for those 12 pets an additional 14 pets were being surrendered to the shelter. This goes on everyday in shelters all over the world. The shelters do what they can but when there is no more room for anymore pets, they are forced to euthanize. There are so many posts of pleads from shelter begging people to adopt so they don't have to euthanize. Many pets are rescued but many pets are being surrendered at the same time. Why such a uproar over a single lion who was killed for his head but not a uproar over pets who are killed and just thrown away in the garbage. When are we going to stand up and demand stricter laws on puppy mills, backyard breeders and pet abuse? There have been some recent changes but not nearly enough to make a difference. What is worse? A person who pays to shoot a wild animal or a person who is paid to kill a shelter pet? Neither one of those animals chose to die. It is heartbreaking that any animal suffers at the heavy handedness of humans. I think we've become so desensitized to all the sad ASPCA ads, etc. we've lost sight of homeless and abused pets languishing in horrid conditions. Thank you for putting a fine point on this. You are so right! We can all help by spaying and neutering our pets and adopting from shelters. Brilliant post! Although I am sad about Cecil, I also agree with you about millions of dogs and cat euthanized in this country every year. I also personally feel very strongly about the millions of farm animals who live through unimaginable suffering in some factory farms. Humans have very strange double standards. Great post! P.S. : Just read about all your amazing work over at Oz's blog. Thanks for being such a wonderful friend to your human, Carma! This is so true. If only people realized (and cared) about what's really going on in kill shelters. I could never work there. It would break my heart everyday, not to mention I'd have to buy a bigger house to shelter them all. I agree that all animals have a right to life and a good one. I was very, very saddened by the death of Cecil and how he died. He was one of the lucky ones, being protected as a national treasure, until a human took matters into his own hands. That is the cause of the uproar. I do think the No Kill Movement is growing in leaps and bounds, as more and more shelters are learning how to properly promote themselves and the animals up for adoption, which is good news. We can't hear the Adopt Don't Shop message enough, so thank you for sharing it. I, also, read about Carma's great works over on Oz's blog. Service animals never cease to amaze me; they are doing such incredible, important work. Bravo, Carma! I'm actually really sad about all of it. I read that while the world was freaking out about Cecil around 5 elephants were slain, too and there wasn't any coverage at all. All of our current pets are shelter rescues. While I am thinking about going to a responsible breeder for my next dog, I'm not sure if we will. Any cats we ever get will be from the shelter. "uproar" :) But seriously, I feel it is all sad, all the animals that are in harm's way, (read: harm's = human). Both things are senseless: the dentist who hunts for sport -- imagine what GOOD THINGS he could have done with that 55-grand instead?! Wanna spend 55K, dude? I can come up with some great ideas. Like, how about donating that much to a shelter in the U.S. to compensate for his horrible sin against nature? Not THAT would be something to Tweet about. I agree that the killing of shelter pets is as senseless as was with Cecil; the problem is that people are sensitized, and the only way to change that is to put pics of the aftermath (of euthanization) in front of everyone's faces through the media (and that will not happen). The uproar over Cecil, and by that, I mean the raging mob on the Internet, was/is acting out of anger over the photos that were plastered alll over the media. Not sure what the answer is to this communication age phenomenon, either, but educating the public about the abundance of shelter pets (and, honestly, to provide safety nets - training, low cost pet food/vet care, etc. - to help keep pets in their current homes) must be a community priority. Thanks for being brave enough to call this issue out. I don't get it either. Cecil's death was sad and tragic and so is all the pets that end up in shelters and are killed. Getting to the root of the problem is what need to be done and I just don't think that most people want to put in the work that it takes to get that done. It's easier for them to hide behind someone else's wrong doing. Great post Carma. I understand why people are so upset about Cecil, but I agree with you. There are many more upsetting things, like shelter pets being killed, that we should be talking and sharing about. What we really need to do is get the media on board, because they are the ones that don't know how to let things go....but how to do that? Do you remember when the public demanded that North Carolina ban the gas chambers in shelters when the photos of animals in them were fighting for their lives? I do. It was a great change. As much as we don't like to see the photos of animals suffering, I think we should discuss the fact at how many botched euthanizations are happening. There are many animals in shelters who don't die peacefully as many think. Years ago there was a shelter manager who was performing botched euthanizations. Animals suffered for hours and maybe even days before the died. There were witnesses who spoke up. Manager got fired and the problem was swept under the rug. Maybe if more of the public knew about those botched euthanizations they would be more outraged about the treatment of shelter pets.